Courtesy of Douglas Elliman of California,, Scott Moore. The celebrity-owned sanctuary is available on market for the first time in 20+ years! 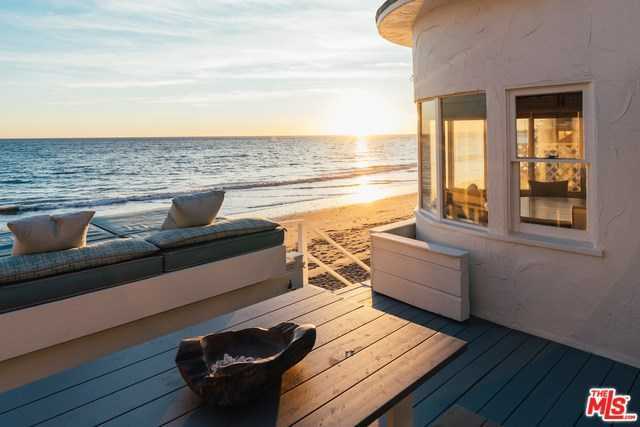 Centrally located on La Costa Beach, the serene beach home has been a getaway for many artists & actors alike & is situated on one of the most private beaches along PCH. The peaceful cottage emanates timeless charm with a unique history. The spacious remodeled, sun-soaked 2 bed 2 bath layout offers custom updated interiors, high-end appliances, hardwood floors, & incredible oceanfront views. An elevated wrap-around deck includes relaxing furnishings, lounge daybeds, & direct access to 40 feet of frontage to your own private sandy beach. This home is conveniently located three doors down from the Malibu La Costa Beach Club & just minutes to the vibrant cities of Santa Monica, Pacific Palisades, Brentwood, & to neighboring beach communities. Don’t miss this opportunity to live the exclusive Malibu lifestyle.